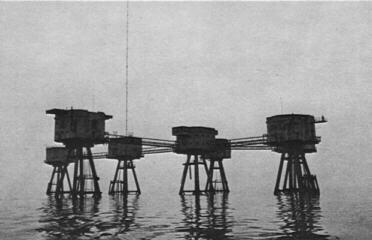 Another station which broadcast from an ex war-time anti-aircraft fort in the Thames Estuary, England, was Radio 390. 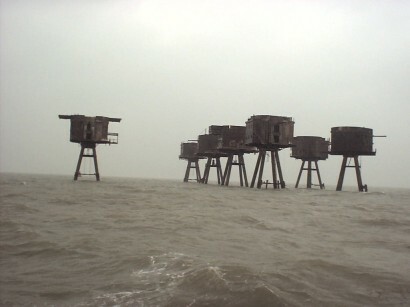 With the offshore pop stations firmly established, Radio 390 found a lucrative niche in the market when it started broadcasting sweet music and easy listening programmes from Red Sands Tower off Whitstable, Kent, on 25/9/65. 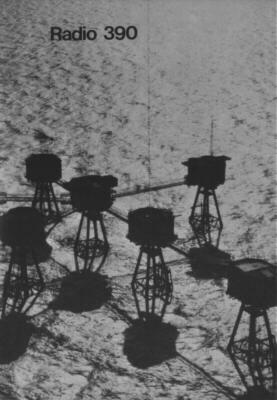 There were seven buildings each standing on four huge supporting legs concreted into the sea bed and they were all connected by rusty catwalks 50 feet above the sea level. Incredibly, the central heating system was still functioning from its war-time days and the accommodation was said to be very comfortable. The presenters were encouraged to be fairly formal in their style and were even expected to be smartly dressed in the studio. The result was a very professional, popular and successful station, but after various arguments in court as to whether the tower was in British territorial waters or not, the station was fined and eventually closed down on 28/7/67 at 17:10. 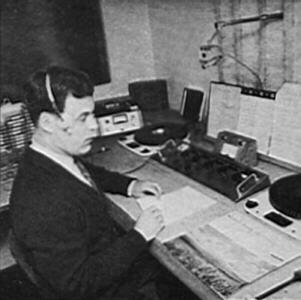 Radio 390 is featured in several recordings in the museum. In the Radio 390 studio with Edward Cole on air. A calm day at Red Sands Tower.